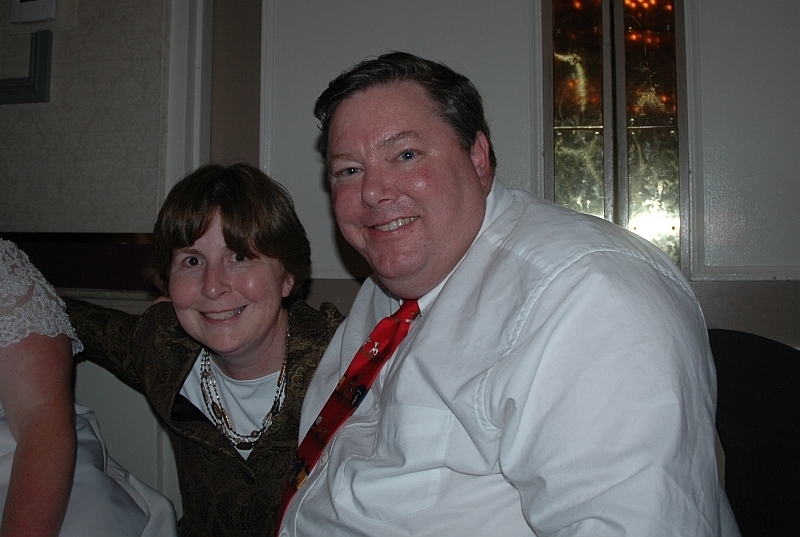 …was Sept 15, 2006 and Mary’s niece Lisa got married. 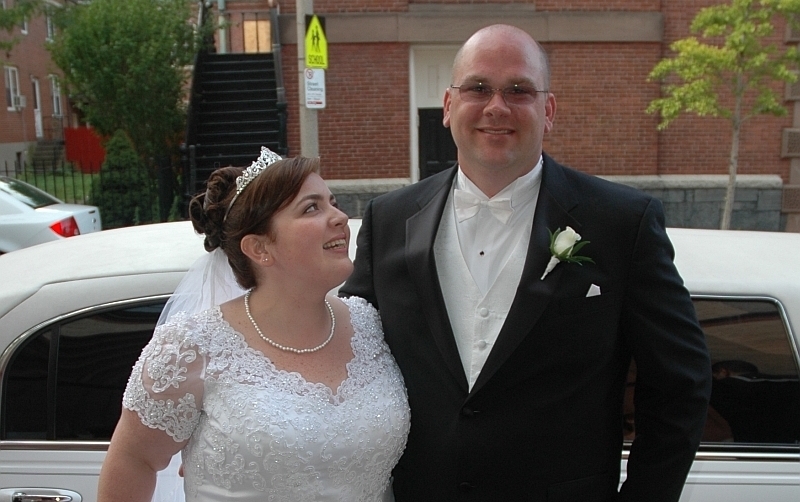 Here’s a picture I took of Lisa and Joe right after the ceremony in South Boston. I actually have another one of both Lisa and Joe looking at my camera taken just before, but I liked this one better because you really can’t fake love, and that is what I see here. After taking this picture, Mary and I headed off to the reception. Christmas comes but once a year but weddings happen all the time so when a wedding invitation comes, I look at it as an envelope filled with wonderful news and the coveted response card as a gift waiting on the inside just for me. That said, the gift comes with a very sharp string attached. In anticipation, my stomach jumped nervously as I looked at the three words taunting me, knowing that this decision would be one that I would have to live with for the rest of my life. And it was at that point that numerous thoughts came rushing through my head, all within a flurry of just a few seconds. Amazing how the mind works! Hey Lisa, ready for the big day? Thanks for the invite – Mary and I are so excited for you and Joe! Oh by the way, can you shed a little more light on just what “beef” you will be serving at your wedding reception? Uhhh, Mary wanted to know. Thought number two: Chicken? Seriously who wastes their choice on chicken? You got a giant steak or a small piece of baked chicken that is probably covered with some type of weird chicken “gravy”. Obviously this is a ploy to have you pick that one as you are getting both chicken and gravy. If that picture talked, I imagine it would be saying over and over: “Hey everyone, it’s chicken AND gravy! Pick me!!!”. Thought number four: Fish? It’s a joke, right? No one in their right mind would ever pick this! Sure it’s the healthiest option but this is a celebration so being health conscious for that day (week, month) is off the table. Careful Roger, don’t even get the pen CLOSE to that box or you could slip and accidentally mark it! What a catastrophe it would be if they put baked fish in front of me! That is, unless it’s fish and chips! Thought number five: How come there isn’t an option to pick both beef AND chicken? Or Fried or Baked? That would be awesome! I should SO be in the Wedding Response Card Design industry! Thought number six: Maybe I could mark down “2” for beef and “1” for chicken and then pretend we are bringing a friend. Then the day of the wedding the “friend” couldn’t make it but they still delivered his/her meal. That would work, right? Thought number 8: Cake! There WILL be cake!!!! I wonder what type of cake? I hope they set it up so after Joe and Lisa cut the cake, they IMMEDIATELY take it in the back, cut it up and then bring it all out on a table so you get to choose which piece you want. What will happen if someone else likes the corner one with the extra side of frosting? Or the special ones with the extra big rose made out of pure frosting on them? Note to self: keep an eye out for the cake table after the cake is taken to the back and consider standing by it for first dibs. Thank God, Mary doesn’t like cake so that’s at least two pieces for me. Sadly, you probably think I am joking, but with little uncertainty, these questions went through my mind on Response Card Decision Day and again and again as I drove to the reception. As it was a special occasion, I figured I should buy a new shirt and suit for it. Well, that and the fact that none of my other suits or shirts seemed to fit me that well. Why does this keep happening? I have adamantly tried to convince Mary on my “Cotton shirts will shrink at LEAST one, if not two sizes when washed and dried!” theory based on my own past experiences and research, but who knew that suits shrink when you take them to the cleaners? The correct answer: no one but me. We arrived at the reception and I was happy to see that there were still appetizers available (Thank you God!) as well as a bar full of beer. We said hello to our friends and family, eventually found our table, and watched as the wedding party marched in and took their place at the head table. Please pass the bread. I felt good because my suit didn’t feel so much like a straight jacket but instead afforded me some well deserved extra room. Plus because it fit so well, no one would even notice I had gained a few pounds. Including myself. Mary loves to dance and fortunately one of my many attributes is that I am an incredible dancer. 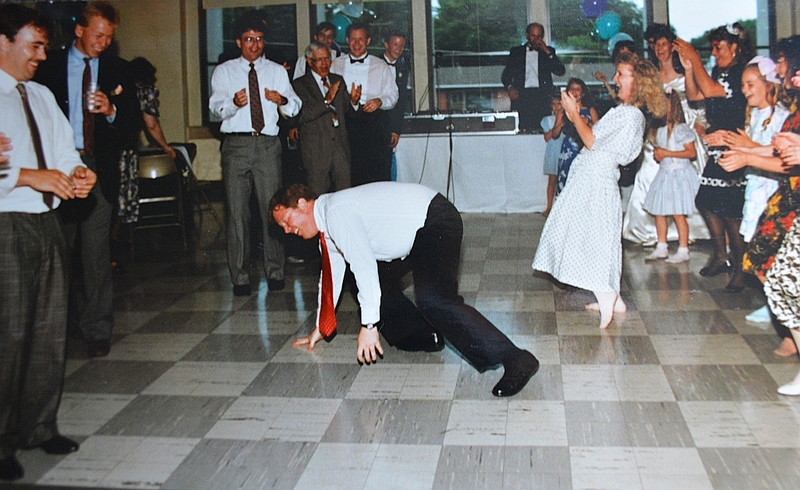 Sure I was a few pounds overweight but that never bothered my feet and after a few beers, I was ready to show everyone why I should have considered a career as a professional dancer (this is in addition to my career as the aforementioned Wedding Response Card Design Engineer). I shed the coat and prepared to grace everyone with my presence as we headed for the dance floor. While I was dancing, I noticed that several people were on the “sidelines” watching me tear it up, no doubt amazed that a 45 year old man carrying an extra 20 or so pounds was able to dance with such fluidicity (yep, that’s a new word that I just made up to describe my dancing) of someone half my age. Now I can’t be 100% sure but I swear I heard murmurs of people saying things such as That’s incredible for someone that’s 20 pounds overweight, I bet he used to be solid gold dancer and He’s got moves like Jagger which is probably where the title of the song came from 5 years later. Think I’m joking? Well fortunately for you, I just happened to have found a picture of me at my friends Bob and Anita’s wedding back in 1990 (I was 31 at the time). Even back then you can clearly see the respect that I had garnered by my incredible fluidicity dance moves. In retrospect, I was “that” guy at the wedding. I initially thought that Mary had graciously allowed me to have the entire dance floor to myself that day but just now realized that there wouldn’t be a Mary in my life for another 6 or 7 months. And HAD there been a Mary back then, chances are after that performance, there wouldn’t be a Mary now. But fortunately there is and she was sitting right beside me 18 years later at Lisa’s wedding. After Mary and I got off the dance floor, I really needed some oxygen but settled for another beer and more cake. My nieces Maureen and Sara were sitting at our table and at some point I must have asked one of them to take our picture. I know I must have had a few beers as I really hate having my picture taken because the vast majority of them do a horrible job of capturing what I actually look like, always making me look much heavier than I actually am. I put the camera away and didn’t think about it until the next day. Who is that guy with Mary? I continued staring at it but honestly did not have a clue who it was. I was going to call Mary into my office and ask her to help identify him but decided to start my own detective work, looking at the pictures before and after. Still got nothing except that I felt bad for him and that he really looked like he was going to have a heart attack at any moment. And then it hit me hard, and I asked myself a question where I hoped…prayed, that the answer would be a resounding “no”: Is That Me??? Three days, and eight years ago was September 15th, 2006 and that was the day that my niece Lisa got married. And sadly, while it was one, if not the most wonderful day of Lisa’s life, a beautiful wedding filled with family, friends, and wonderful memories, unfortunately for me, it was and will always remain the day “that” picture was taken. And just as that day changed Lisa’s life for the better, it also changed mine for the better. I just didn’t know it at the time.